This tour allows you to explore three of the best and most diverse destinations in South America. 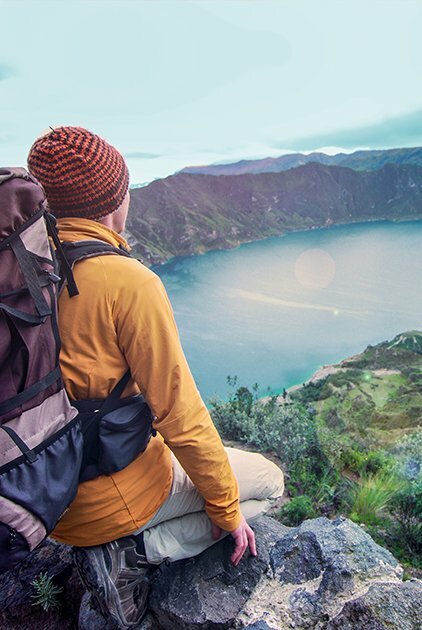 From mysterious jungles deep in the Amazonian rainforest, to the colonial landmarks of historic Quito in the Andean highlands, and to the exotic evolutionary wonders of the Galapagos Islands, all three of these locations are in the tiny nation of Ecuador – yet each is packed with stunning impressions and remarkable experiences. You will find that Quito is a treasure trove of architectural and artistic delights, boasting one of South America’s best-preserved colonial centers. Your guide will take you to neo-Gothic and Baroque churches, leafy plazas, political buildings, lavish palaces and, depending on your tastes, you might also visit some of the city’s museums or boutiques, or simply stroll along the colonial cobblestone streets as you learn about the history of this vibrant city. Leaving the hustle and bustle of the big city, we will head for the Galapagos archipelago, where snorkeling with sea lions, soaking up the sun alongside iguanas, and marveling at the natural beauty is just a typical day! Situated off the coast of Ecuador, this isolated haven of biodiversity is home to a dazzling array of birds, reptiles, fish and mammals that you won’t find anywhere else. Leaving the land of evolutionary change, you will then head to the Amazon rainforest – where time stands still. Here, you will undoubtedly enjoy the rustic yet chic décor of your own upscale cabin at Sacha Lodge. Located in a private 5,000-acre reserve in the heart of the jungle, there is no end to the activities; and after a day’s adventure exploring the Amazon, you’ll find that the Sacha Lodge is perfectly geared for total relaxation! All in all, this Andes + the Galapagos Islands + the Amazon Rainforest Tour will be a once-in-a-lifetime journey that you will never forget. Upon your arrival in Quito, you will be met at the new international airport and driven to Casa Aliso, a centrally located 10-room boutique hotel in the Ecuadorian capital city. AM: This morning we will explore Quito’s colonial center: the best preserved historic district in the Americas. Here, you can learn about Quito’s history and artistic legacy while admiring the stunning architecture of its colonial buildings and the uniqueness of its pieces of religious art. PM: This afternoon, we will continue to the famous “Middle of the World” complex on the equatorial line, where you will be able to straddle the planet’s two hemispheres. A great photo op..!! AM: This morning you will be driven to the Quito airport for your flight to the Galapagos Islands. Landing first on Baltra Island and then on Isabela Island, you will be welcomed and driven 20 minutes from the town of Puerto Villamil to Scalesia Lodge. Situated in the highlands of Isabela Island on the slopes of a volcano, this modern, luxurious, safari-style tent resort is in the middle of a 16 hectare (40 acre) property of a magical forest. From the resort are spectacular views of Isabela Island’s coast, the Pacific Ocean and other islands of the Galapagos archipelago dotting the horizon. PM: Following lunch and a chance to relax, we will visit Sucre´s Cave and enjoy a short walk to appreciate the typical vegetation and endemic plants of the island. We will then head to the Mirador de Mango lookout point, where you can take in the panoramic views of southern Isabela and the island’s agricultural area. This is also a great place for spotting Darwins Finches. AM: Today we will visit some of Isabela Island’s best attractions: the Sierra Negra and Chico volcanos. Sierra Negra is one of the most active volcanoes of the archipelago, and its crater – with a diameter of 10 kms – is considered the second largest in the world. “Volcan Chico” is also an active volcano, and sulfur vents can be seen spewing from it. 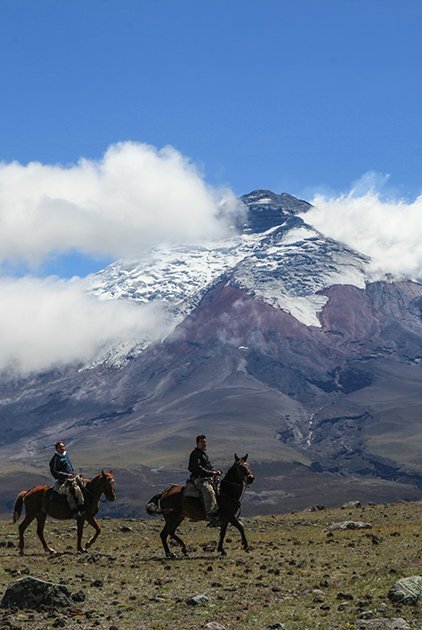 This 6-hour walking tour will allow you to appreciate all the splendor of these amazing volcanoes. For those who do not wish to go on the volcano hike, an alternative activity is a visit to Los Tuneles. A 30 to 40 minute ride on a small speedboat will take you to this unique place where cooled lava flows have been impacted for ages by the ocean’s waves. 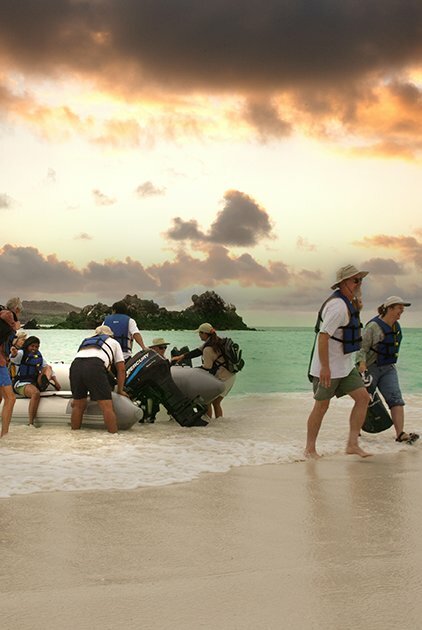 This visitors’ site is a marine paradise for Whitetip reef sharks, Galapagos green sea turtles, Galapagos sea lions, manta rays, Parrot fish, Yellow-tail surgeon fish and many other aquatic species. PM: After returning to the lodge for lunch, this afternoon you can enjoy Concha Perla Bay, where you will be able to swim and snorkel alongside tropical fish, sea lions, penguins and turtles. It’s also possible to observe up to 20 bird species here. AM: This morning we will visit Las Tintoreras, an islet formed by lava flows and located 10 minutes by dinghy from Puerto Villamil. This islet’s name comes from Whitetip reef sharks (called “Tintoreras” in Spanish), which are frequently seen in the waters of this area. Other species that can be spotted here include sea lions, marine iguanas and penguins, which all make this a perfect place for snorkeling. PM: We will return to the hotel by lunch time, and in the afternoon visit a historic site on Isabela Island: El Muro de las Lagrimas (“The Wall of Tears”). This wall was built with huge blocks of lava that were laid by exile inmates between 1945 and 1959, when Isabela Island was a penal colony. AM: Early in the morning, you will be driven back to the Isabela Island airport to take your flight back to Baltra Island, where you will be met and escorted to the town of Puerto Ayora on nearby Santa Cruz Island. We will visit Las Grietas (“the Crevasses”), which is a one of the Galapagos Islands’ most enchanting locations; it consists of series of three elongated, almost rectangular pools amid tall lava cliffs. PM: In the afternoon, we will visit Tortuga Bay Beach, located to the southwest of Puerto Ayora. Its name means “tortoise,” since it is the favorite place in the area for sea turtles to lay their eggs. After this visit, you will be taken to Finch Bay Hotel for dinner and the night. PM: Overnight at Finch Bay Hotel. NOTE: Itineraries in Galapagos subject to change without notice. The sequence of visits might be altered depending on arrival of flights to Baltra or Isabela, weather conditions, or other unexpected circumstances beyond our control. AM: After breakfast, you will be driven to the Baltra airport for your flight back to Quito. PM: Arriving in Quito in the afternoon, you will be driven to the Casa Aliso Boutique Hotel, located on a quiet street in Quito’s financial district and a short walk from the Mariscal entertainment district. AM: This morning you will be picked up at your hotel and driven to the Quito airport, where you will embark on a 30-minute flight to the Amazonian town of Puerto Francisco de Orellana, locally known as “Coca.” Here, you will be met by your naturalist guide and board a large motorized canoe for a scenic 2-hour ride down the majestic Napo River to the Sacha Lodge. PM: Upon entering Sacha Lodge’s private reserve, you will take your first walk along a raised boardwalk stretching through a dense flooded palm forest in which several species of monkeys are often sighted. Dugout canoes await to carry you across the Pilchicocha Lake to the lodge itself. You will arrive with time to settle in, do some birdwatching, swim or take a walk under the forest canopy before dinner. Activities based at Sacha Lodge are spread out over a wide area and allow visitors to explore several distinct but equally fascinating Amazonian habitats. A visit to the lodge’s on-site butterfly farm is not to be missed. Another of Sacha Lodge’s highlights is the “Canopy Walk,” which is one of only a few rigid, self-standing suspension canopy walkways in the world. Two of the three towers have observation platforms every 12 meters, making the towers accessible for everyone. The 275 meter (900 feet) long canopy walkway is suspended at a height of 36 meters (120 feet) above the forest floor. Another favorite activity of guests is to paddle dugout canoes along the nearby tannin-rich black-water creeks and lakes, where luxuriant lianas, bromeliads and palm trees thrive. 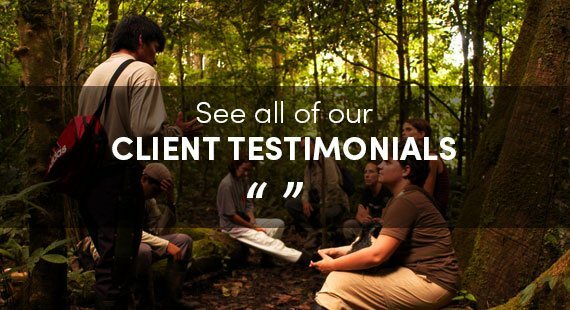 Also, located ten minutes across the Napo River, you can find the Nueva Providencia Interpretation Center, offering Sacha guests the opportunity to speak with women from the community and learn about the Kichwa lifestyle. This 2-day visit to the Amazon culminates with the tasting of the local cuisine! But for adventurous souls, the day doesn’t necessarily end with dinner. Nocturnal jungle walks and canoe trips, aided by flashlights, often reveal creatures such as caiman, which are seldom seen during the day. AM: After breakfast, we will walk back to the Napo River pier, where a motorized canoe will be waiting to take us back to Puerto Francisco de Orellana (“Coca”). From Coca, we will fly back to Quito. PM: Overnight at the Casa Aliso Boutique Hotel. AM: After a hearty Andean breakfast, you will be driven to the Quito airport for your flight home or onward.